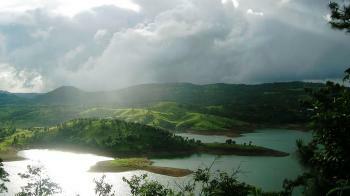 In the state of Meghalaya, India there is beautiful lake to visit known as Umian Lake. 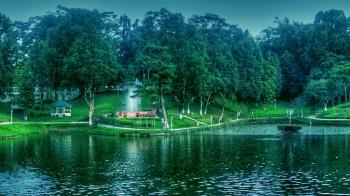 This lake is located in the hills of Shilong at the distance of 15 km. This lake is also known as Barapani Lake. This lake is famous for water sports. There are many beautiful attractions in this place. There are many things to do like Water cycling, kayaking, Scooting and Boating. Thousand of visitors come here to do these things. Umian lake covers the area of 220 square km. The type of Umian Lake is Reservoir. Umian Lake is created by Damming the Umian River. This lake is created in the year of 1960. This place is popular for Adventure facilities. There are many other things to do in this lake which are attracts the tourists every year. Water complex offers many things like Row boat, Paddle Boat, Cruise boats, Sailing Boats etc. The name Umian is translate into the words "Water of Tears". The ideal duration of this place is 1 to 2 hours. In the State of Meghalaya, India there is beautiful place for visit known as Cherrapunji. It is located in the district of East Khasi Hills. The Historic name of the Cherrapunji is Sohra and Churra which means "the land of Oranges" and Cherrapunji is also spelled by Cherrapunjee. This place is famous for Hill Station. The altitude of this place is 1484 mt. above the sea level. Khasi and Hindi languages are mostly used in this place. There are different places to visit in the Cherrapunji. There are different festivals celebrated in the Cherrapunji. Nongkrem Dance and The Shad Suk Mynsiem are two important festivals in this place. Nongkrem Dance is held in the month of October and November and the Shad Suk Mynsiem is held in the month of April. 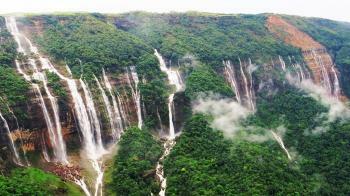 Cherrapunji holding Guinness book of World record as the wettest place on earth. Cherrapunji has slipped to the second place by Mawsynram holding the record for highest rainfall. Cherapunji is a town of historic beauty which attracts thousands of tourists on regular basis from all around the world. Cherrapunji is best place for trekking. The best path for trekking is Decker Root. There are different activities held in this place. These activities are Rope bridge, Rock climbing, Camping etc. Shillong "The Abode of Clouds", one of the smallest states in India is a capital and a hill station of Meghalaya situated at an average altitude of 5003 ft with highest Shillong Peak of height 6450 ft. Shillong city is in the center of the shillong plateau and is surrounded by the hills, three of them are : Lum Sohpetbneng, Lum Diengiei and Lum Shillong.